inspired by the artist’s work and the periods he recreated. Our BREATH is the bridge which connects our consciousness to nature and life itself. We are continually moving through air, much the same way a fish moves through water. sustaining us, and allowing us to express life’s nuances. Dance with Sculpture is a program that directly resulted from a collaboration between Grounds for Sculpture and MM2 Modern Dance Company over eleven years ago after an experimental and most successful performance that occurred to a small audience of fifty. Since 2003, the collaboration between GFS and MM2 has offered 30 cross-disciplinary dance and sculpture programs, serving thousands of persons of all ages. 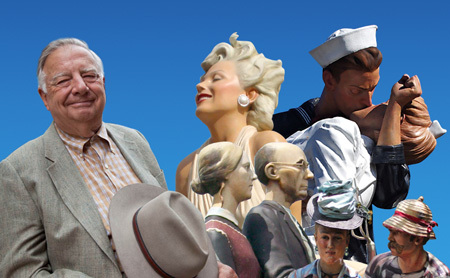 Dance with Sculpture has provided new and innovative interpretations and appreciation of the sculptures on the site and led to a deeper appreciation of both art forms. Feedback provided by audience members and participants has indicated that the interaction of the dancers with the sculptures and the natural environment creates an aesthetic experience that is life-enriching for all. MM2 dancers are able to work with artists and art in the park, create new choreography and gain exposure and feedback for their works. Grounds for Sculpture attendees have also had an opportunity to observe the creation of site-specific pieces and works in progress, as MM2 rehearsed and worked at Grounds for Sculpture with specific artists/sculptors. The success of this program has given impetus for the expansion of this collaboration. For the past eleven years, MM2 Modern Dance has found a home at the Grounds for Sculpture, where it has been able to dance and offer a variety of programs to the public in one of the most inspirational of settings. 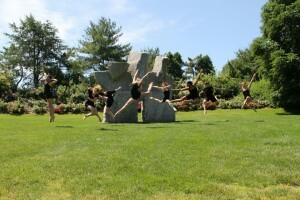 In 2010, both M2 Modern Dance and Grounds for Sculpture celebrated their mutual tenth anniversaries. 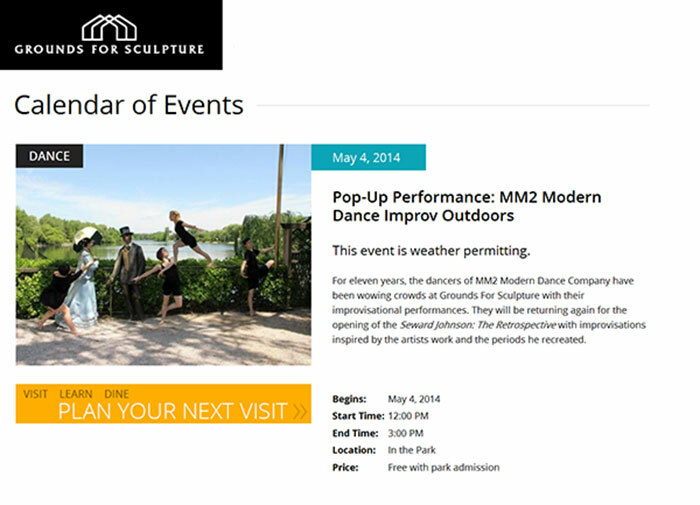 MM2 Modern Dance continues to be the resident dance company at Grounds for Sculpture offering a series of special performances and workshops throughout the year. Grounds For Sculpture, located in Hamilton, New Jersey (midway between Philadelphia and New York), is a whimsical thirty-five acre sculpture garden and arboretum on the former site of the New Jersey State Fairgrounds. Founded by Seward Johnson to promote an understanding of and appreciation for contemporary sculpture, the park has been enchanting visitors since 1992, and in 2010 will celebrate its 10th year as a not-for-profit organization. Grounds For Sculpture features more than 250 contemporary sculptures, and two 10,000 square foot museum galleries with rotating exhibits. In addition, the park offers workshops for children and adults, concerts, performances, fairs, shopping and fine dining at the Zagat’s-rated Rat’s Restaurant, which recently was awarded Philadelphia Magazine’s Best of Philly 2009: Most Romantic Restaurant. Visit www.groundsforsculpture.org for more information.